World Refugee Day protests hit Hamilton, advocates say cuts are hurting refugees and compromising pubic health. Federal cuts to refugee health care are unethical and unnecessary, according to heath experts in Hamilton. "What health care providers are seeing is people having to choose between rent and food and health care. The government frames this as a cost-saving measure and a way to discourage bogus refugee claimants. But what I see on a day-to-day basis is that it denies sick people the medical care they need. It’s uncompassionate," said Dr. Tim O’Shea, a specialist in internal medicine and infectious disease and Assistant Professor of Medicine at McMaster University. Last year, the federal government cut drug, dental and vision coverage offered to refugee claimants who have not been in Canada long enough to qualify for provincial health coverage. The changes also ensure that failed refugee claimants would only be treated for sicknesses that posed a public heath risk. Ottawa said that the cuts were designed to prevent bogus and failed refugee claimants from having access to health care that Canadian citizens do not have access to. Some in health care reject the argument that public health is being served by the rule change, and charge that it might even be compromised. Terri Bedminster, Director of Operations at Refuge: The Hamilton Centre for Newcomers Health described "a Catch-22 situation" in which refugees might be afflicted with a disease like HIV, but cannot visit a health care centre to get tested because they are unable to afford it. "It’s a shame, and public health is not being protected [by the cuts]," said. Ms. Bedminster. "No one is trying to milk the system, they just want care. They’re in need." Patients are confused and concerned about their health care status, according to those on the front lines. Sue Grafe, a nurse practitioner that has worked with refugee patients for thirteen years, said that many of the families she sees are worried that they will not be able to get the help that they need, and that their health care issues might spiral out of control. "They don’t know what they’re eligible for because the process is unclear. We can provide an assessment and we can refer to a pediatrician, but we can’t do tests….so they just end up going to the emergency room," Ms. Grade said. Last June, demonstrations took place across a handful of Canadian cities to protest against the cuts, and this year protests will be held in over a dozen locations across the country. 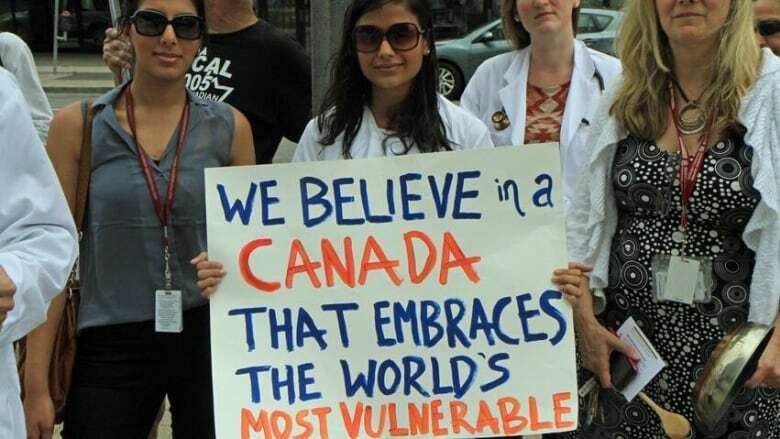 In Hamilton, health care workers, social activists and refugee support workers will gather outside the federal Citizenship and Immigration offices on 55 Bay Street North to protest the cuts. Several hundred people are expected to attend. Dr. O’Shea said that the protest is about health care, but it is also about Canada’s international reputation. "People come here from terrible conditions and situations across the world, and they feel unwelcome. They are treated with suspicion, like they’re ‘the other.’"